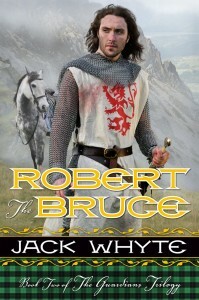 Bruce is sixteen, and has been a afraid of his formidable old grandfather, Robert Bruce of Annandale, all his life. Now, for the first time, he finds himself alone with the old man, who has wakened him in the wee small hours and summoned him downstairs to talk to him. Lord Robert was seated in his large, padded wooden armchair, close to a blazing fire in a brazier set into a small hearth by the one stone wall, and as his grandson entered he cocked his head to one side and scanned the boy from head to foot, nodding in approval at the heavy woollen robe. Rob did as he was bidden and the aroma from the contents of the jug caught sharply at his nostrils as his lordship took it from him, along with the two mugs. Rob wrapped the iron handle of the kettle in a much-singed, thickly layered pad of cloth that hung by the fireside and, directed by Lord Robert, poured hot water carefully into each cup. Rob sipped with great caution, knowing the water was very hot, but even so the sharpness of the drink took him by surprise, snatching at his breath and closing his throat and forcing him to set the cup down quickly lest he spill it in the coughing fit that racked him. His grandfather watched him in astonishment. “What– What is that?” Rob gasped eventually, gaining control of himself. The old man’s eyebrows were still arched in surprise, but now he definitely was smiling. Rob saw the smile and it was his turn to be amazed, for the old man’s expression was altered beyond belief, seemingly lit from within by the warmth of that single, unexpected smile. Rob rose obediently and shrugged out of the heavy woollen robe, then stood unmoving as the old man scanned him, up and down and from side to side. The strange taste in Rob’s mouth was instantly forgotten, replaced by a sudden conviction, born of nothing more than the old man’s question, that the next words he spoke would be of great import. Cautiously then, his slow movements belying his racing thoughts, he sat up straighter and pulled his shoulders back, acutely aware of the piercing scrutiny of his grandsire’s pale blue eyes. His first impulse was to protest that the imputation was untrue but he found himself shying away from the blatant lie and wondering how to answer otherwise. All his confused, lifelong feelings about this man reared up again and yet they were confounded by the incontrovertible evidence of the past few minutes wherein he had seen the old man smile and heard him laugh and speak quietly, even gently; things he had never experienced before tonight and would not have thought possible an hour earlier. And now this pointed question, sharp and straightforward, demanding an answer. He ground his teeth together, braced himself and looked directly into the fierce old eyes. “Explain that. What do you mean?” There was no passion in the question, no anger or outrage. And that gave Rob the courage to continue. He set his cup down with great care on a small table by his chair, then spoke what was in his mind, aware, without knowing why, that he was doing the right thing. “Hmm…” The patriarch looked down at his cup for long moments, then raised it and sipped deeply before looking back at his grandson’s pale face. He nodded then, and wiped the corners of his mouth with a thumb and forefinger, completing the movement by scratching his chin audibly. Then, while Rob sat watching him, he sniffed loudly and nodded a second time. “No,” Rob said, but even to himself he sounded less than certain, and the elder Bruce leaned closer. What was the question, exactly? Rob knew he could not simply blurt it out in the crude words that had first sprung to his mind, not without angering the old man. The matter was impertinent already, without adding insult to the form of it. And so he thought about it carefully, looking for the words in which to couch it without making it any more offensive than it already was. He bought some time by sipping again at his neglected drink, enjoying the taste of it more now that it had cooled, but he could feel his grandfather’s eyes watching him. He coughed gently, feeling the fiery liquor catching at his throat, then shuddered violently and set the cup down again. The old man frowned, clearly displeased and on the point of saying so, but then he relaxed and sank back into his chair, the response, whatever it might have been, unspoken. He settled his shoulders against the padding at his back and his eyes narrowed to slits and Rob sat wordless, waiting for the quiet wrath that he was sure must come. But his grandfather surprised him yet again, for instead of growling out some scathing rebuke he merely pursed his lips and scratched at his beard as he had done before and when he did speak his voice held no trace of anger. The old man fell silent, his face, which had been so animated earlier, now strangely empty; his eyes, dull and unfocused, staring into nothingness. There was a stillness to his pose that worried Rob, but then he shivered and clutched at the woollen shawl that draped his shoulders, pulling it closer about him, and only then did Rob notice that the brazier fire had dulled. He rose quietly to his feet and stooped to replenish the fire, thinking that his grandfather had no need of being watched in his grief. He chose short, thick logs of apple wood from the rack by the hearthside and thrust them deep into the glowing coals, one by one. When he was satisfied and went back to his seat he found Lord Robert watching him, all evidence of his temporary lapse gone from his eyes. I was crying in the wilderness, like John the Baptist, Rob thought, but he made no attempt to say it. He was too busy savouring the sensation of euphoria that had flooded him as he listened to what Lord Robert had said about his father and how he would like to make amends if he could, and his throat was swollen painfully from the realization of how wrong he had been in his lifelong dislike and fear of this newly revealed man.